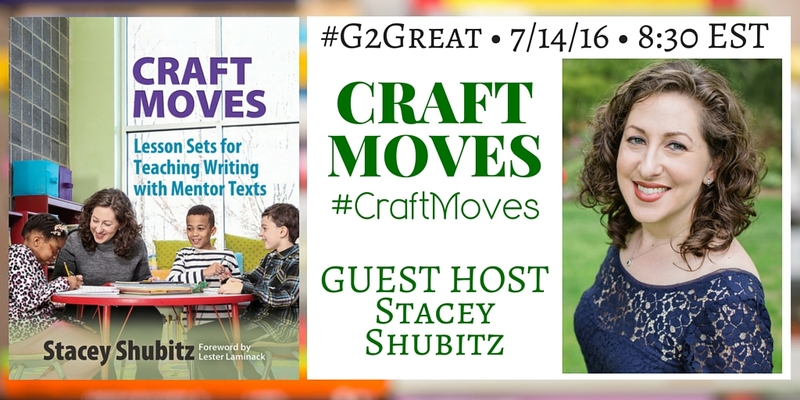 Stacey Shubitz joined #G2Great on 7/14/16 to reflect on her incredible new book, Craft Moves: Lesson Sets for Teaching Writing with Mentor Texts (Stenhouse, 2016) In the foreword, Lester Laminack illustrates why Stacey’s voice is needed to illuminate the powerful role of mentor texts, “Stacey is a thinker, a reflective practitioner who works with ideas and refines practice until it blossoms.” And blossom we did as Stacey planted new #G2Great seeds of mentor text joy. In Craft Moves, Stacey celebrates the use of authentic texts in the form of picture books to “help writers notice things about an author’s work that is not like anything they might have done before, and empower them to try something new.” Stacey brings that goal to life on page after page of Craft Moves in a step-by-step journey further deepened as our #G2Great guest host. One of the most powerful aspects of mentor texts is that it provides a purposeful structure where we can initiate a thoughtful merger of reading and writing. Since beautifully written picture books are the heart of mentor texts, we are able to use this instructional union to honor the reciprocal nature of reading and writing and simultaneously inspire and enrich the literacy lives of students from both sides. With texts at the center and knowledgeable teachers selecting those texts in the name of students, mentor texts offer a rich approach to share picture books that will beckon our readers and then use those same texts as a model for student writers. In other words, mentor texts create a circle of understanding where wonderful pictures books are the very seeds we use to grow readers and writers. Quite honestly, it doesn’t get much better than that! Picture books as mentor texts offer a glimpse into the instructional possibilities that abound between two covers. By inviting authors to become teachers in our classrooms, we can spotlight the very craft moves we want our students to use in their own writing as we zoom in closer as reader and writer. Within this mutually supportive process, we build deeper ‘transformative’ understanding that will strengthen writing. Picture books offer a treasure trove of craft moves in authentic ‘bite size bits’ (thank you Cathy Mere) as we engage students in productive dialogue that will serve as a springboard to their own writing. This wonderful joining of forces brings teachers, authors, children and texts to a joyfully engaging learning party. Stacey shows deep respect for the role of teachers in her discussion of mentor texts. Teachers select and mine these texts for craft moves and then use them in meaningful ways with children so Stacey acknowledges that the real impact resides in teacher decision-making. This is a much welcome shift from a current emphasis on teaching from a lens of compliance over professional responsibility. Through a personal exploration, teachers are invited to choose texts that will support craft moves according to their students’ needs and instructional goals as teachers maintain their critical role as responsible to their own teaching. Having a clear plan in mind serves as an instructional GPS but we also leave ample room for thoughtful meanderings that rise from in-the-moment teaching. After all, isn’t that what good teaching is all about? Every excellent teacher knows that teaching is a process of discovery that begins with students. In order to effectively use mentor texts in our classrooms, we must know three things intimately: the book, the literacy process, and the children we are lucky enough to have sitting in front of us. We certainly acknowledge that our teaching begins with a deep knowledge of literacy and books, but we also maintain a steadfast commitment to our knowledge of students. We recognize that it is this knowledge of the learners in front of us that makes mentor text instruction responsive. Keeping students at the center acknowledges that the most effective mentor text lessons do not come from a scripted lesson design but from our close observations of learning in the trenches and our ability to translate those observations into flexible instructional practices. Picture books offer a masterful blend of visuals and print for layered support that invites every child to the learning table. This combination of print and picture virtually opens supportive learning doors that may otherwise be closed to some readers and writers. Pictures books are the ticket that enthusiastically invites each learner into the experience. The role of mentor texts that merge reading and writing also allows us to use each stage of the gradual release of responsibility model as we blend whole class, small group, side by side and independent opportunities based on the needs of children. This flexible decision-making grounded in the needs of students empowers us to use the texts that will then empower our readers and writers in a glorious domino effect of benefits. I place this final point at the end because it reflects the very spirit of all we do. While we entwine, expand, envision, embrace, elevate, and empower our efforts to use mentor texts, we do all of these things to entice our students into the experience of reading and writing. We know that we give our students a precious gift when we use beautiful texts that beckon readers and make them ‘hungry’ for more. By immersing students in texts that speak to their heart, we then strengthen that gift so that they can write from their heart. We also recognize that there is a cautious balance between mining a text for craft moves and teaching points and the risk that comes from sucking the very life from the texts we chose to inspire readers and writers in the first place. I can’t think of anything more important than achieving this balance as we celebrate mentor texts in our classrooms. Ah yes Stacey, we are ready and prepared for that joyful venture indeed! From Lester’s words, “Stacey is a thinker, a reflective practitioner who works with ideas and refines practice until it blossoms” to the final pages of the book and throughout the chat and this blog post, Stacey’s vision of a writer shines! The role of mentor texts is to inspire and energize our writers – not a recipe to be followed but cluing teachers into how to choose mentor texts and providing examples of how those texts can be flexibly used to meet the needs of students! The book and the chat are so Stacey – she’s right there with us as a teacher and a collaborator! Thank you for capturing that essence, Mary! Thanks for your kind words about me and my book, Fran! I greatly appreciate it. I’m glad you enjoyed the book too!